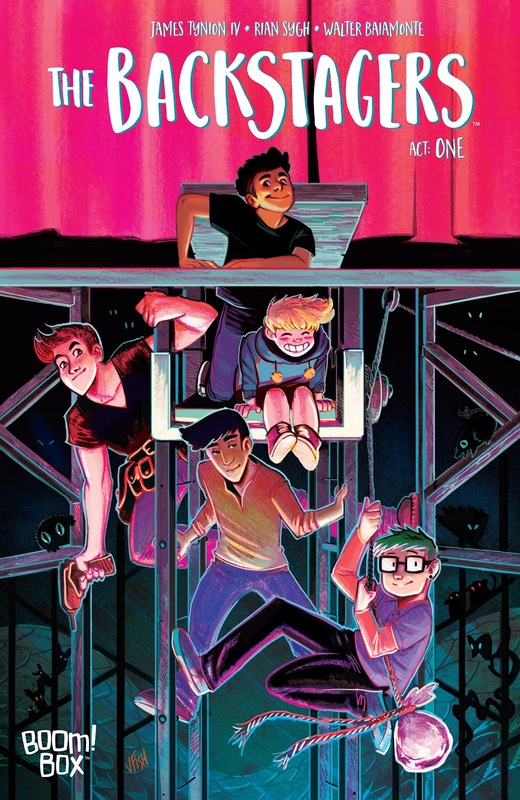 The Fellowship was fortunate enough to obtain a copy of THE BACKSTAGERS #1 from BOOM! Studios. The story is by James Tynion IV, with art by Rian Sygh, colors by Walter Baiamonte, and letters by Jim Campbell. Jory is having a difficult time adjusting to being at a new school, especially an all-boys school. His mom encourages him to join a club in order to make some friends. He decides to join the Drama Club headed by stage divas Blake and Kevin McQueen. They send our hero to locate a tiara from the backstage. Jory is about to literally walk through a doorway into other worlds and become…a Backstager. Tynion is no stranger to the teens in other worlds, but this series appears to be a lighter than his other BOOM! Series THE WOODS. This book has the potential of being a really exciting series (with minor annoyances from the McQueen brothers). Rian Sygh’s art really fits the tone of the book and Walter Baiamonte’s use of colors is very striking. They create a great visual that compliments the book perfectly. Check it out. THE BACKSTAGERS #1 is available for ordering at www.boom-studios.com.